In an ironic twist, American evangelical leaders are joining mainstream acceptance of contraception. 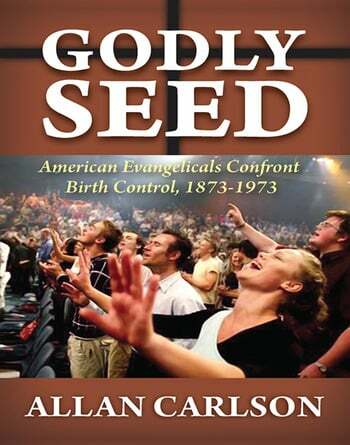 Godly Seed: American Evangelicals Confront Birth Control, 1873-1973, examines how mid-twentieth-century evangelical leaders eventually followed the mainstream into a quiet embrace of contraception, complemented by a brief acceptance of abortion. It places this change within the context of historic Christian teaching regarding birth control, including its origins in the early church and the shift in arguments made by the Reformers of the sixteenth century. The book explores the demographic effects of this transition and asks: did the delay by American evangelicals leaders in accepting birth control have consequences? At the same time, many American evangelicals are rethinking their acceptance of birth control even as a majority of the nation's Roman Catholics are rejecting their church's teaching on the practice. Raised within a religious movement that has almost uniformly condemned abortion, many young evangelicals have begun to ask whether abortion can be neatly isolated from the issue of contraception. A significant number of evangelical families have, over the last several decades, rejected the use of birth control and returned decisions regarding family size to God. Given the growth of the evangelical movement, this pioneering work will have a large-scale impact.